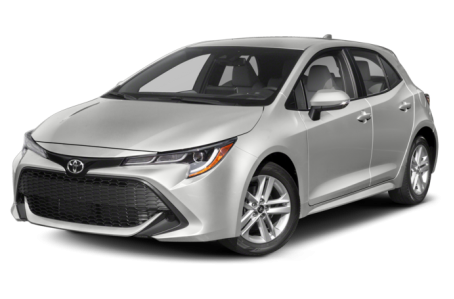 The 2019 Toyota Corolla Hatchback is an all-new, compact five-door that replaces the discontinued Corolla iM hatchback. It has a cargo volume of 17.8 cubic feet. It competes with the Ford Focus, Volkswagen Golf, and Mazda3. Under the hood, the Corolla Hatchback is powered by a 168-hp, 2.0-liter four-cylinder engine mated to a standard six-speed manual or an optional continuously variable transmission. Two trims are available: SE and XSE.